It’s time for my baseball stories to end with one more extra inning of vocabulary. Intentional Pass: Sometimes the manager will signal for an “intentional pass.” If a feared slugger is up with runners in scoring position and first base empty – then “walk” the slugger on purpose – that is four pitches not over the plate and a free pass to first. If the next batter hits a grounder you might get a “double play” – two outs on one play – a grounder, a force at third or second, and a quick relay to first. The antidote to an intentional pass is to have a second feared slugger in the “on deck circle” waiting to be next up. Run-Downs (aka a “pickle”): Oh-Oh! You’re picked-off! The pitcher sees you leading off and throws to first to have you tagged-out while you’re off the base. Instead you dart towards second and get in a “run-down.” The first baseman throws to the second baseman, but you are not forced, so the second baseman has to tag you (not the base) with the ball; now you avoid getting tagged by darting back towards first; the second baseman throws back to the first baseman to apply the tag; you reverse course again, and so on, until either you get tagged out or they throw the ball away (commit an error). There once was a pickle between home plate and the dug-out (where the players sit when not on the field). It happened in a rookie league game – a low-minors game, not a major league game. 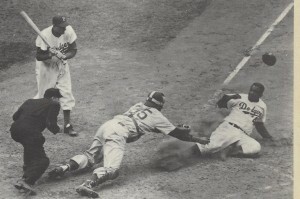 The runner slid home – but missed the base; the catcher applied the tag – or thought so; the umpire said neither “Safe!” nor “Out!” The runner, not thinking he’d missed the base, headed to the dug-out. The catcher finally figured it out: the runner had missed the plate and he had missed the tag, so the runner was not yet either safe or out. With ball in hand he approached the dug-out to apply the tag, but all the peach-fuzzed faces looked the same, so he started at one end applying the tag one player at a time and looking towards the ump for a call. The runner, realizing his time to be tagged was inevitable, suddenly darted towards home and a run-down between home and the dug-out ensued. 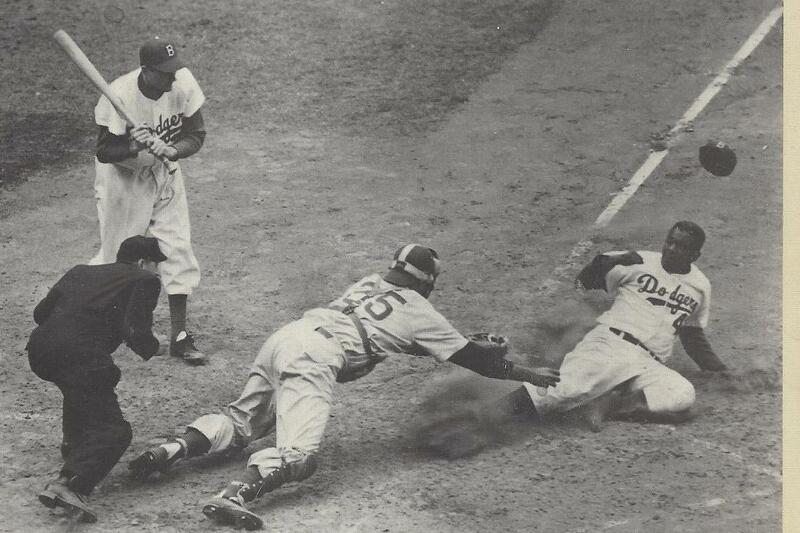 Suicide Squeeze: Maybe the most exciting play in baseball – and very rare. With a runner on third and less than two out, the manager signals for both a steal and a sacrifice bunt. [See 1st Inning for what these things are.] The pitcher winds-up and delivers the pitch towards home – at that same instant the runner breaks towards home. Since a pitched ball is faster, has a shorter distance to travel, and will arrive first, the runner should be an easy out. But No! the batter bunts the ball, and even though the batter gets thrown out at first, the run has scored. It’s called a “suicide squeeze” because if the batter can’t get the bat on the ball, the runner is dead meat. Occasionally a really good baserunner steals home without there even being a bunt. Paul Molitor, the current Twins manager, was really good at this. If the pitcher isn’t paying attention to you, and the third baseman isn’t holding you close to the base for a possible pick-off . . . you can get a really, really big lead-off . . . and if the pitcher has one of these long, long wind-ups . . . . and you’re a really, really fast runner (who has studied the pitcher enough to know when the wind-up is about to start), you can get to home almost as fast as the thrown ball – but it helps if the pitch is high and the catcher has to reach down to apply the tag. Molitor grew-up playing “sand-lot ball” in St. Paul, Minnesota. The first time Molitor stole home as a minor-leaguer, he called his Little League (and later Attucks Brooks American Legion) coach, Billy Peterson, to thank Billy for teaching him everything he knows about baseball. Billy Peterson is a true St. Paul baseball legend. My favorite thing to do in the summer is sit in the stands and watch a sand-lot baseball game with Billy Pete, listening to his stories and analyzing the plays with him. My kid Nick has been lucky to have Billy for a coach. “Touch them all!” This is what the Twins baseball announcer says after a Twins’ Home Run. A Home Run is when you hit the ball out of the park – fair – and get to slowly jog or “walk” around all four bases without a fielder being allowed to make a play on you. But it has to be a fair ball, between the foul poles at the end of the chalk lines going down the first and third base lines, and not a foul ball. Hitting a Home Run with the bases loaded (runners on third, second, and first) is called a Grand Slam. In St. Paul, in the 60s, I played bar-league ball for The Selby Place Tavern, located near the Cathedral – but later torn down and replaced with some apartment buildings. The 60s were a much more tolerant time for “What is Fun.” After our games we’d hang out and have a few beers, and if one of us had hit a Grand Slam that day, Dewey Brougham, the owner would let us shoot off his cannon, akin to Bill Veeck’s exploding scoreboard at Comiskey Park. We’d wheel it out of the back room, load it with gun powder and a cannon ball, aim it out the door, light the fuse and watch the cannon ball roll slowly across Selby Avenue – there was never enough oomph to get any trajectory. When his place was condemned to build the apartments, the City relocated Dewey to Snelling Avenue, where he operated The Pit & Paddock Bar for years and the home of the St. Paul Riff Raff softball team – a place, and a team, generating many more stories, but for another day.